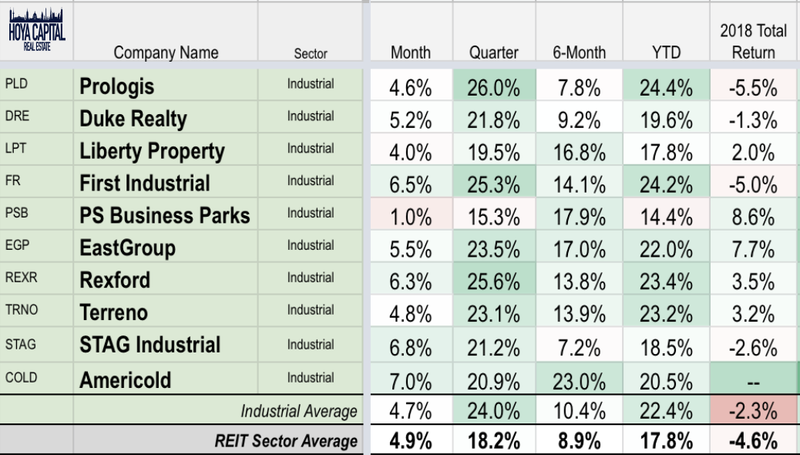 Since the start of 2016, no major real estate sector has outmatched the performance of industrial REITs, outperforming the broader REIT index by a cumulative 45% during this time. Outside of Amazon, industrial REITs have been perhaps the biggest beneficiaries of the continued growth in e-commerce and the rabid “need for speed” among goods distributors and logistics operators. Among real estate sectors, industrial REITs have been most impacted by the positive economic surprises since the start of 2016, aided by corporate tax reform, deregulation, and trade policy. A common theme over the past several years, however, valuations remain lofty. Given the large pipeline, the sector remains more exposed than most to an unexpected economic downturn. For now, it’s full steam ahead. 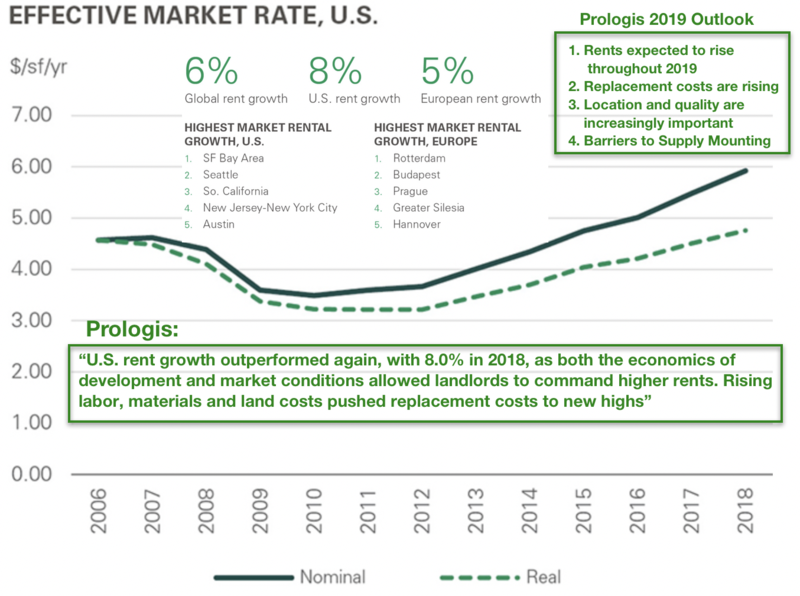 Rents grew another 8% in 2018 according to Prologis as demand once again outpaced supply, the ninth consecutive year of a positive demand imbalance. In our REIT Rankings series, we analyze each of the commercial and residential real estate sectors. We rank REITs within the sectors based on both common and unique valuation metrics, presenting investors with numerous options that fit their own investing style and risk/return objectives. We update these rankings every quarter. Industrial REITs comprise roughly 10% of the REIT Indexes (VNQ and IYR). Within the Hoya Capital Industrial REIT Index, we track the ten largest industrial REITs, which account for roughly $85 billion in market value: Prologis (PLD), Duke (DRE), Liberty (LPT), First Industrial (FR), PS Business Parks (PSB), EastGroup (EGP), Rexford (REXR), Terreno (TRNO), Stag (STAG), and Americold (COLD). Investors looking to invest in the sector through a pure-play ETF can do so through the Pacer Benchmark Industrial REIT ETF (INDS). 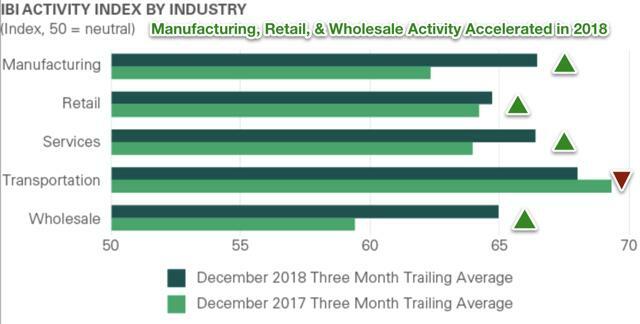 Demand for industrial space has been relentless over the last five years, primarily driven by the rapid growth of e-commerce and the "need for speed" in goods distribution. Consumers and businesses alike are demanding ever-shortening delivery windows, necessitating the densification of supply chain networks and the establishment of distribution hubs closer to end-customers. Outside of Amazon (AMZN), we think that industrial REITs are perhaps best positioned to capitalize on the continued growth of e-commerce. 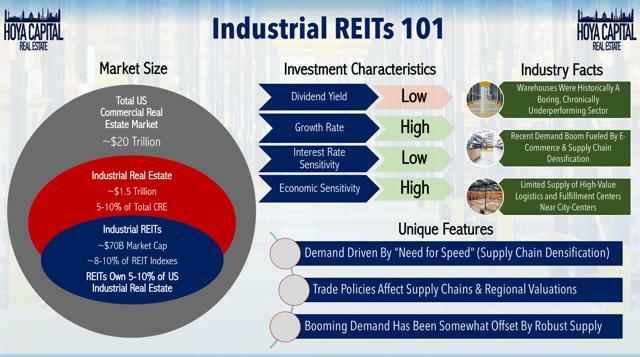 Industrial REITs own roughly 5-10% of total industrial real estate assets in the United States. 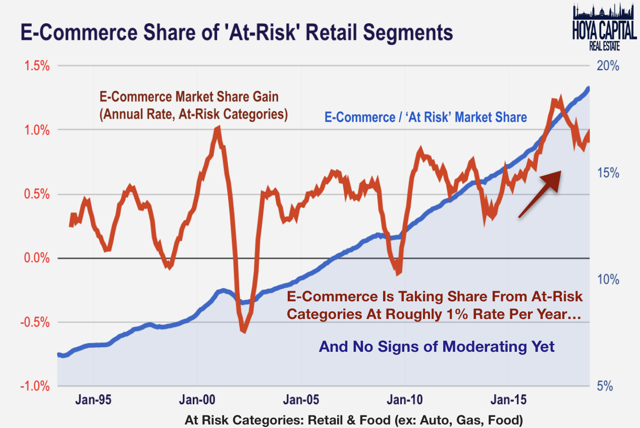 E-commerce sales still represent just a small fraction of total retail sales, but roughly half of the incremental growth in retail sales over the past three years has come from e-commerce. Importantly, e-commerce is far less efficient than brick and mortar from an industrial space usage perspective. Each dollar spent on e-commerce requires roughly three times more logistics space than brick and mortar, according to estimates from Prologis. According to our estimates, e-commerce still accounts for less than 20% of total "at-risk" retail categories but is taking market share from these sectors at a rate of roughly 1% per year. Demand for industrial real estate space has been relentless in the post-recession period as the growing importance of strategically-located assets has resulted in higher barriers to entry for new supply. As we'll discuss below, demand growth has outpaced supply growth in each of the past nine years, which has resulted in favorable fundamentals and tight leasing conditions, particularly for the highest-quality, distribution-focused assets. 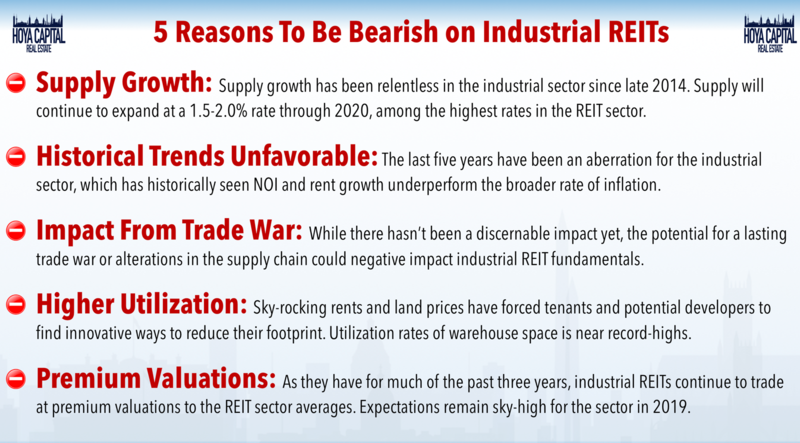 Below we outline the five primary reasons that investors are bullish on the industrial REIT sector. Interestingly, industrial REITs were not always the high-flyers of the REIT sector. Quite the opposite, in fact. Before 2016, the sector was regarded as chronic underperformers as same-store NOI growth lagged the broader REIT average for essentially the entire preceding decade. Before the recent trends of supply chain densification, industrial space was highly commoditized and any demand imbalances were quickly met by new supply, keeping rent growth modest, a function of the short construction time requirement and relatively low capital requirements. The need for well-located assets near major population centers has changed the dynamics of the sector, but supply growth does remain one of the key potential headwinds to performance. Construction spending on warehouse assets has increased substantially beginning in early 2014 and the development pipeline remains as large as ever. Additionally, warehouse users are increasingly focusing on technologies to improve the efficiency and utilization of existing space. Given the large pipeline, the sector remains more exposed than most to an unexpected economic downturn. For a valuation-perspective, a common theme over the past several years, valuations across traditional metrics like FFO/share for industrial REITs remain lofty. Below we outline the five reasons that investors are bearish on the sector. At the time of our previous sector update, What Trade War?, trade tensions dominated the headlines and stock market volatility had pushed the S&P 500 to the bring of bear-market territory. We noted that the headlines appeared to be nothing more than noise based on positive commentary from Prologis and continued strength in underlying fundamental metrics. Interestingly, industrial REIT demand metrics have been one of the more accurate leading indicators of macroeconomic economic conditions over the past decade. Among real estate sectors, industrial REITs have most impacted by the positive economic surprises since the start of 2016, aided by corporate tax reform, deregulation, and trade policy. 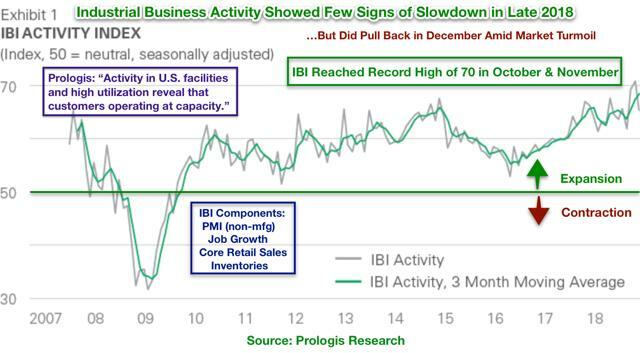 Demand for warehouse space has historically shown a high correlation with several economic indicators reflected in the Prologis IBI Activity Index -PMI, retail sales, job growth, and inventories- all of which have inflected higher since bottoming in late 2016 and remain strong through the early part of 2019. 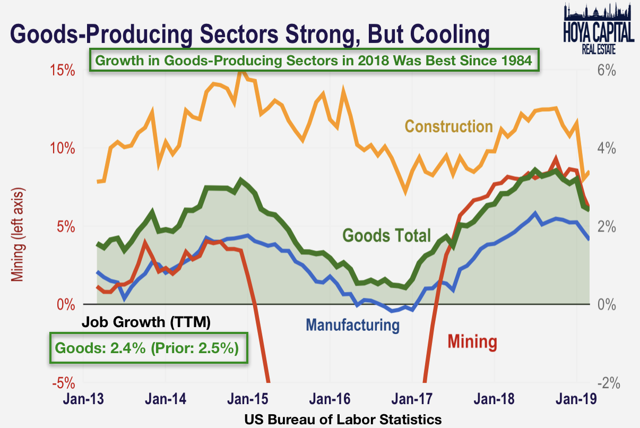 The IBI reached a record high in October and November of 2019 before retreating slightly in December. Below we note that, remarkably, in 2018 goods-producing employment saw the strongest employment growth since 1984. 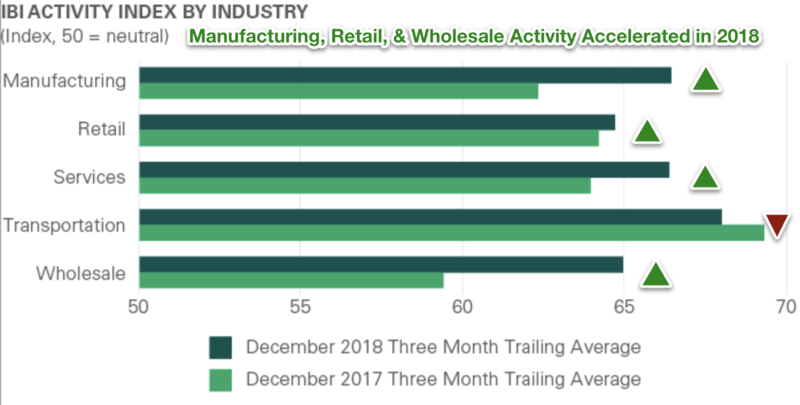 Digging deeper into the data, consistent with jobs data showing a resurgence in goods-producing and manufacturing employment, the manufacturing and wholesale segments of the IBI Activity Index have seen the most significant acceleration in 2018. At the regional level, Prologis noted some impacts from trade discussions including relative weakness in Mexico as companies presumably focus on US-domiciled assets and manufacturing operations and are willing to pay the premium to avoid the trade uncertainty. Within the US, Prologis also noted a continued premium being placed on well-located distribution-focused assets near major population centers. The company noted in their recent report, "High-barrier-to-supply markets with geographic, legislative and other hurdles to new development have the strongest fundamentals." After forecasting late last year that supply growth may finally outpace demand in 2018, strong demand pushed net absorption above completions for the ninth straight year, pushing the vacancy rate to new record lows. After growing at a 9% rate in 2017, US industrial rents rose another 8% in 2018 according to Prologis, stronger than the 6% global average. 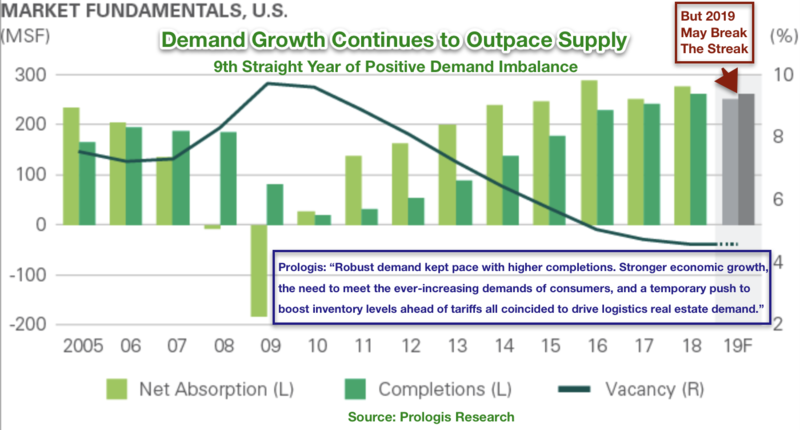 Behind this demand growth, Prologis sees a "greater willingness to pay for quality space as e-commerce, the need to be close to consumers, and rising consumer expectations around speed and product availability are pushing a mandate for quality." The company expects continued rent growth in 2019 and mounting barriers to supply growth in the urban infill markets. Fourth-quarter earnings were generally better-than-expected across the industrial REIT sector, although same-store NOI growth did slow from last quarter for most REITs in the sector. Forward guidance was generally seen as positive but realistic, bucking the trend from other REIT property sectors of giving overly conservative guidance. 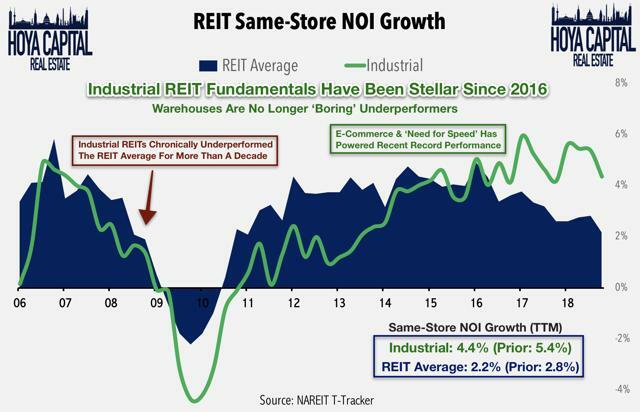 We analyze earnings results from a subset of industrial REITs below, noting that same-store NOI growth remained stable from 2018 but is expected to moderate next year as further occupancy gains become increasingly more challenging. Full occupancy is a good problem to have, but it does mean that future same-store growth must come exclusively from rental rate growth. 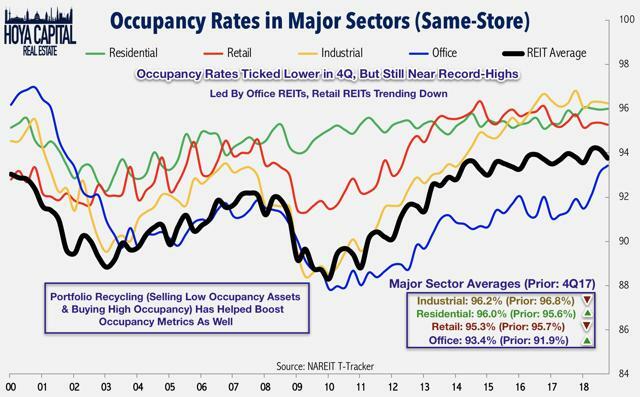 Despite supply growth that has averaged nearly 2% per year since 2015, occupancy reached a new record-high at the end of 2017 and remain above 96% throughout 2018 according to NAREIT T-Tracker data. Occupancy dipped as low as 88% in 2009 and has risen in every year since then, ending 2018 at 96.2%. 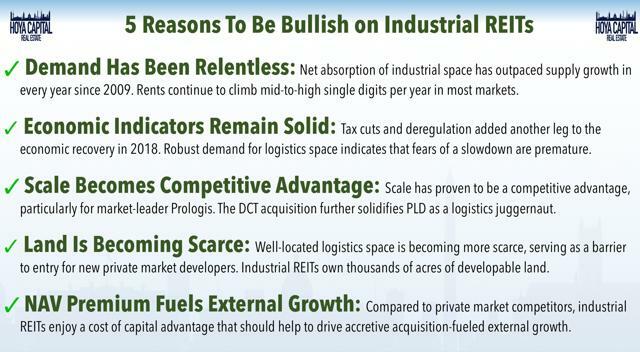 In addition to robust organic growth, industrial REITs continue to benefit from the added tailwind of external growth, primarily fueled by development. After trading at a slight NAV discount early in 2018, the recent REIT rally has allowed industrial REITs to regain the coveted NAV premium, which is critical for further accretive external growth. Despite rising construction and land costs, development yields remain favorable. 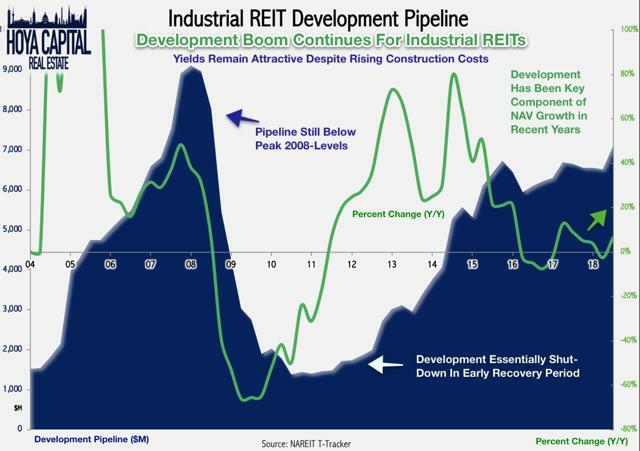 According to NAREIT data, the industrial REIT development pipeline ended 4Q18 above $7.1B, the highest level since 2008 and showing a modest acceleration after moderating through 2017 and early 2018. These REITs continue to see more value-add opportunities in ground-up development compared to acquisitions and see development yields at roughly 6-8% compared to cap rates between 4-6%. As a result, industrial REITs have been net sellers over the last three years. That's not to say they haven't been active in the transaction markets. 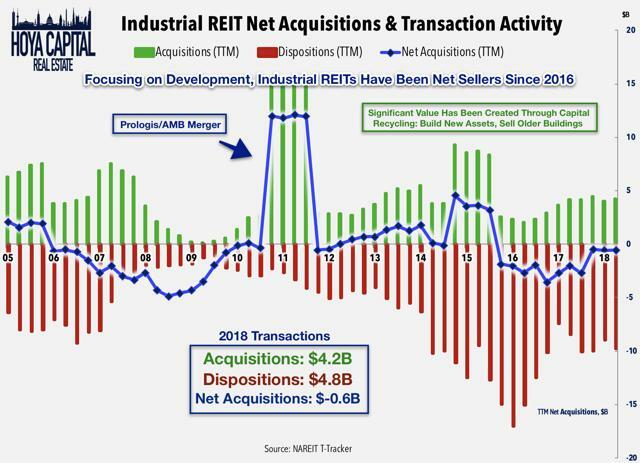 REITs transacted more than $9 billion in assets over the last twelve months, seeing value creation by capital recycling: developing new assets and selling older assets to private market buyers. 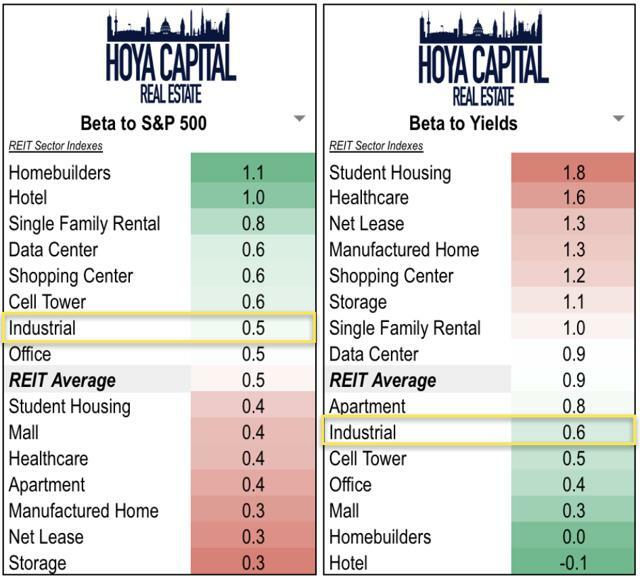 Since the start of 2016, no major real estate sector has outmatched the performance of industrial REITs, outperforming the broader REIT index by a cumulative 45% during this time. 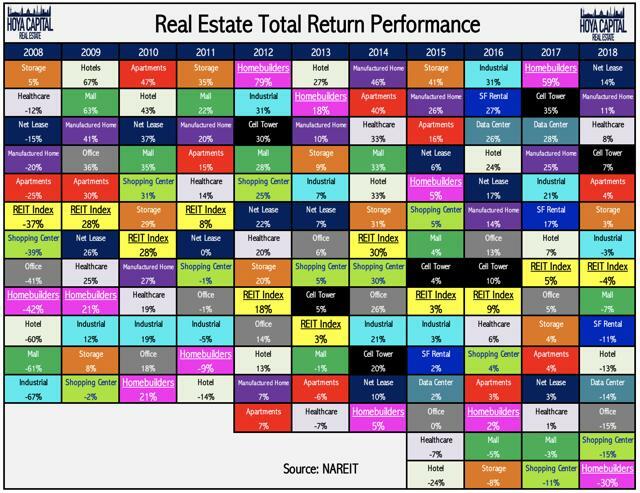 Despite trading at valuation premiums for most of this time, the sector has outperformed the REIT average in three straight years, outdone only by the four-year outperformance streak of the cell tower sector and the remarkable six-year streak delivered by the manufactured housing sector. 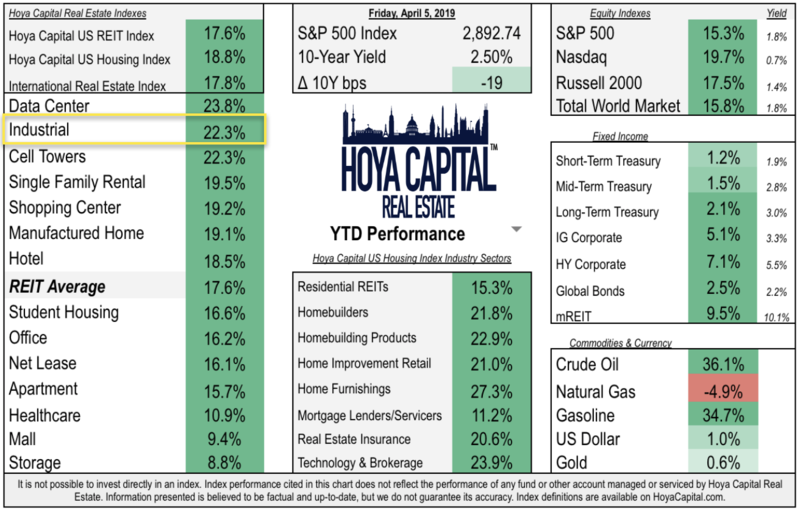 After dipping 3% last year, the sector is back to it's winning ways in 2019, with the Hoya Capital Industrial REIT Index jumping more than 22%, second only to the data center sector's 24% gains, compared to the 18% rise in the broader REIT index. The broader REIT sector has benefited by receding interest rates and a return of "Goldilocks" economic conditions of low inflation and solid domestic economic growth. Prologis has been the top performer so far in 2019 but was among the laggards last year. All ten components of the index are higher by at least 14% so far this year. 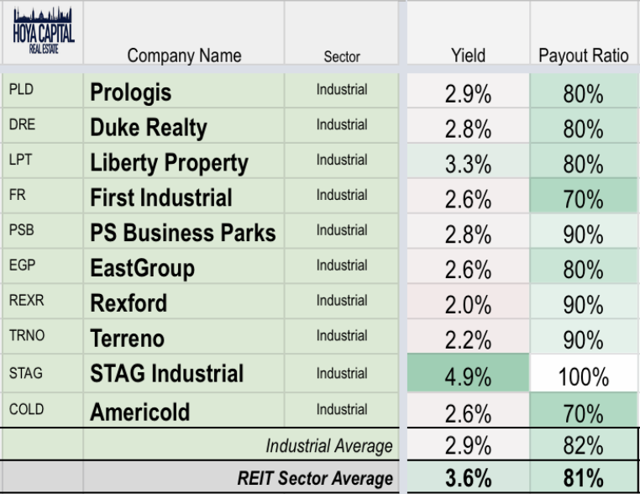 Generally, the higher quality distribution-focused REITs including Prologis, Duke, and Rexford have outperformed this year after lagging in 2018. 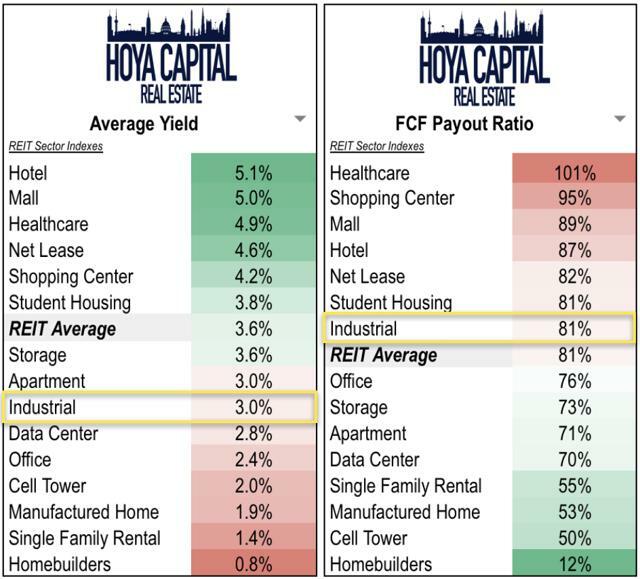 As they have for most of the past three years, industrial REITs continue to trade at a sizable Free Cash Flow (aka AFFO, FAD, CAD) premium to the REIT averages according to our estimates. When we factor in two-year growth expectations in our FCF/G metric, however, the sector appears more attractively valued. During this run of outperformance, we note that growth has generally been chronically undervalued, underscored by strong performance in the e-REIT sectors (industrial, data center, and cell towers). During this time, value has generally underperformed, underscored by weak relatively performance from the retail REIT sector. Compared to other REIT sectors, industrial REITs are not highly sensitive to interest rates and generally respond more closely to movements in the equity markets. Industrial leases have an average term of around 5 years (roughly average among REIT sectors) and the majority of leases are structured on a net lease basis, meaning tenants assume most or all property-level operating expenses. Property taxes are the most significant operating expense accounting for 50% or more of total expenses. Longer lease terms and the use of net lease terms are generally associated with higher levels of interest rate sensitivity. Based on dividend yield, industrial REITs rank below the REIT average, paying an average forward yield of 3.0%. Industrial REITs pay out roughly 80% of their available cash flow, leaving a decent cushion for development-fueled growth and future dividend increases. 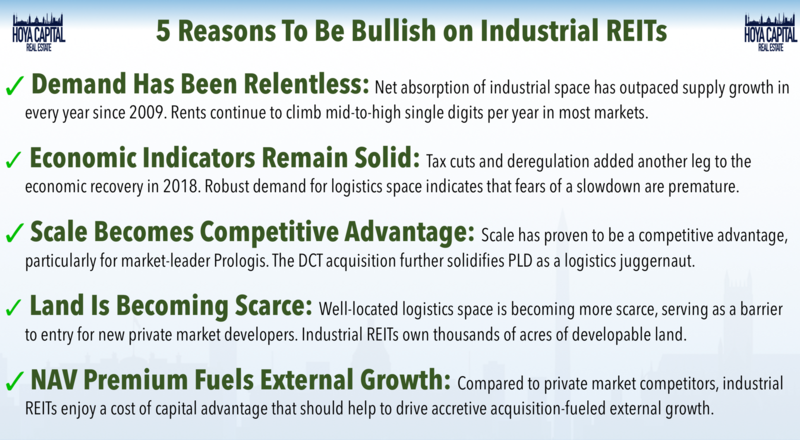 Within the sector, we note the varying strategies of the ten industrial REITs. STAG, which is generally popular with yield-focused investors, pays the highest yield but does so through allocating a higher share of free cash flow towards dividend payments. Bottom Line: Tired of Winning Yet? 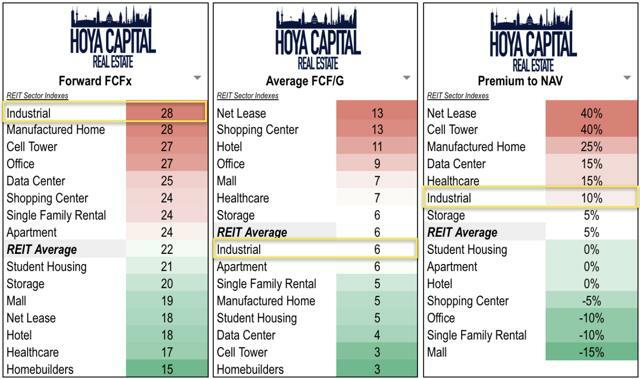 Since the start of 2016, no major real estate sector has outmatched the performance of industrial REITs, outperforming the broader REIT index by a cumulative 45% during this time. Outside of Amazon, industrial REITs have been perhaps the biggest beneficiaries of the continued growth in e-commerce and the rabid “need for speed” among good distributors and logistics operators. Among real estate sectors, industrial REITs have most impacted by the positive economic surprises since the start of 2016, aided by corporate tax reform, deregulation, and trade policy. A common theme over the past several years, however, valuations remain lofty. Given the large pipeline, the sector remains more exposed than most to an unexpected economic downturn. For now, it’s full steam ahead. Rents grew another 8% in 2018 according to Prologis as demand once again outpaced supply, the ninth consecutive year of a positive demand imbalance. If you enjoyed this report, be sure to follow our page to stay up-to-date on the latest developments in the housing and commercial real estate sectors. For an in-depth analysis of all real estate sectors, be sure to check out all of our quarterly reports: Net Lease, Data Center, Manufactured Housing, Student Housing, Single-Family Rentals, Apartments, Cell Towers, Manufactured Housing, Malls, Shopping Centers, Hotels, Office, Healthcare, Industrial, Storage, and Homebuilders. Disclosure: I am/we are long VNQ, PLD. I wrote this article myself, and it expresses my own opinions. I am not receiving compensation for it. I have no business relationship with any company whose stock is mentioned in this article.